First pancake flip of 2015 on Stephen Avenue! 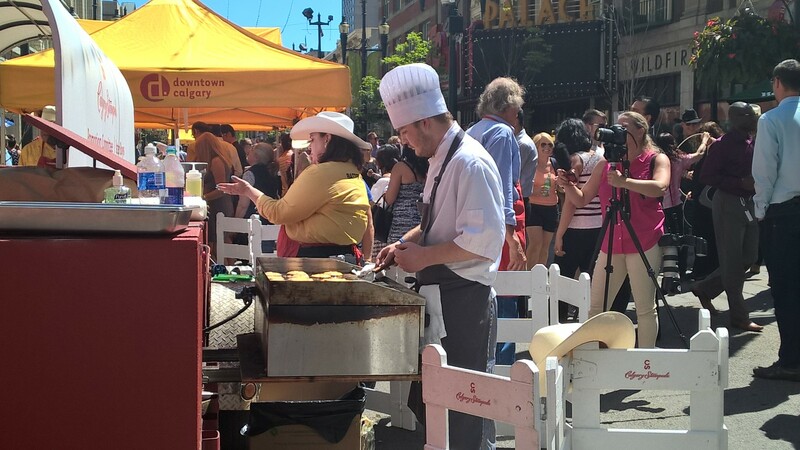 4240 hungry pancake fans were able to get their fill on Stephen Avenue as we teamed up with SAIT Polytechnic to celebrate Calgary’s diversity through pancakes! 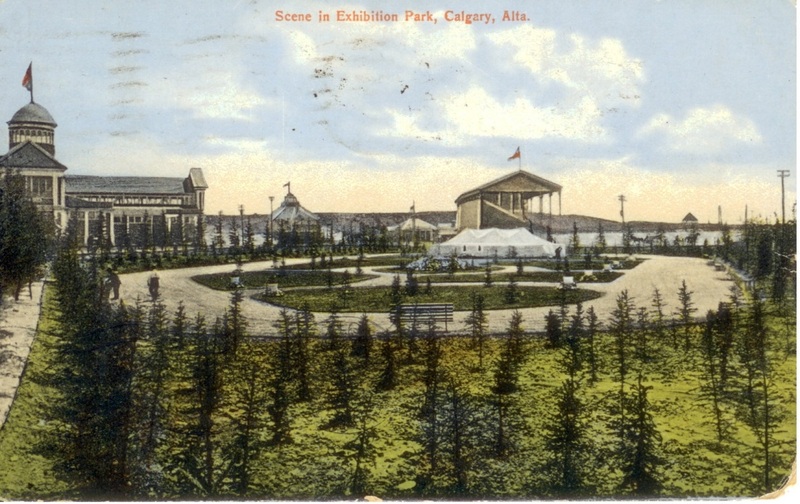 This year we thought that it would be a great way to shake things up by offering different types of pancakes that pay homage to Calgary’s diverse and ever evolving food scene. 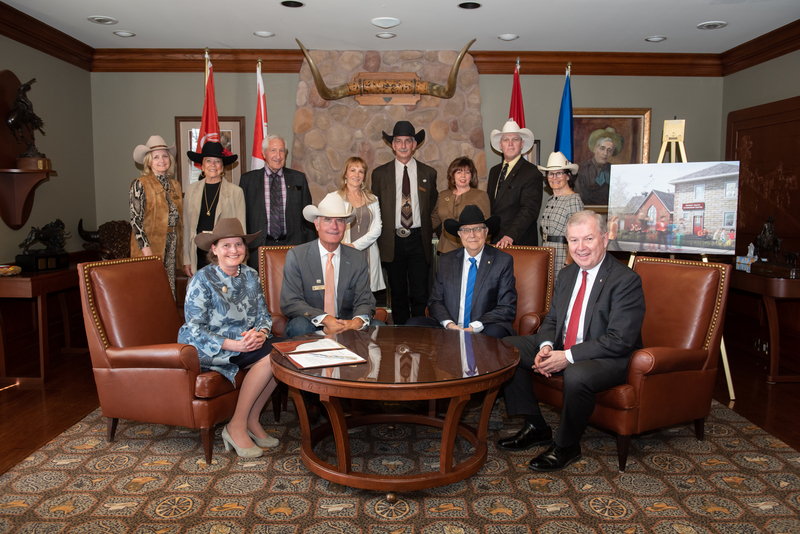 When the Stampede initially approached SAIT back in January, we had a simple dream: to host a summit around the ultimate worldwide comfort food, pancakes! 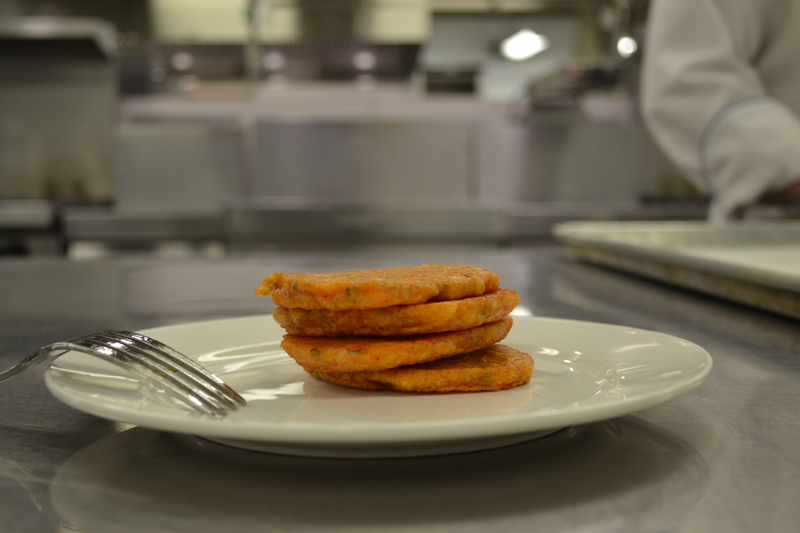 We connected with Chef Mark Beattie and Chef Bruno Lesage– who brilliantly interpreted four international pancake recipes. 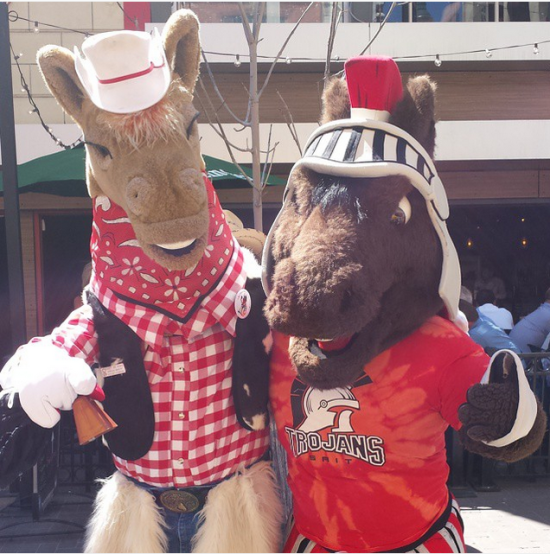 Pictured: Harry the Horse and Troy the Trojans Warhorse horsing around on Stephen Avenue. Together we kicked off the first pancake event of the season on Stephen Avenue and served up five unique pancakes for our guests to try: Venezuelan cachapas, Swedish potato pancakes, Eastern European blintz, Korean kimchi pancakes and Calgary’s own, the western pancake. Korean kimchi pancake stack– orange you impressed by the innovation of the SAIT Culinary Campus chefs?! 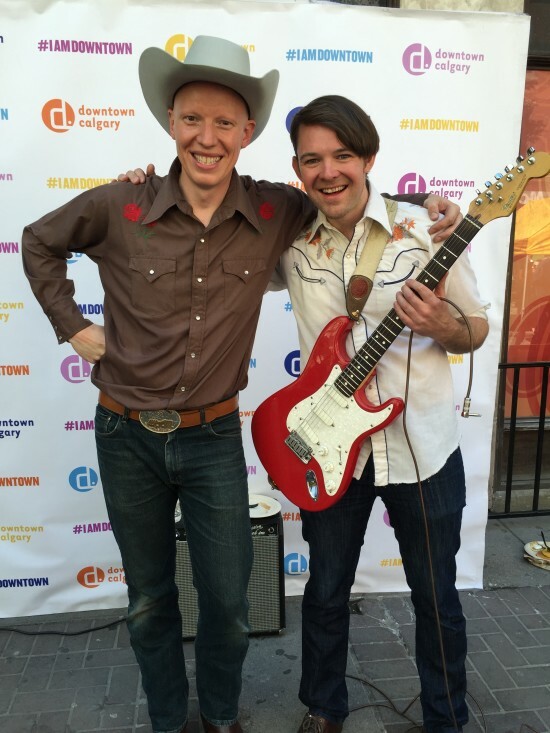 From 11 a.m. to 1 p.m. on Monday June 8, SAIT students in partnership with the Stampede’s Batter Boys, pancakes fresh off the stove, while Matt Masters, courtesy of the Calgary Downtown Association, gave a live performance! 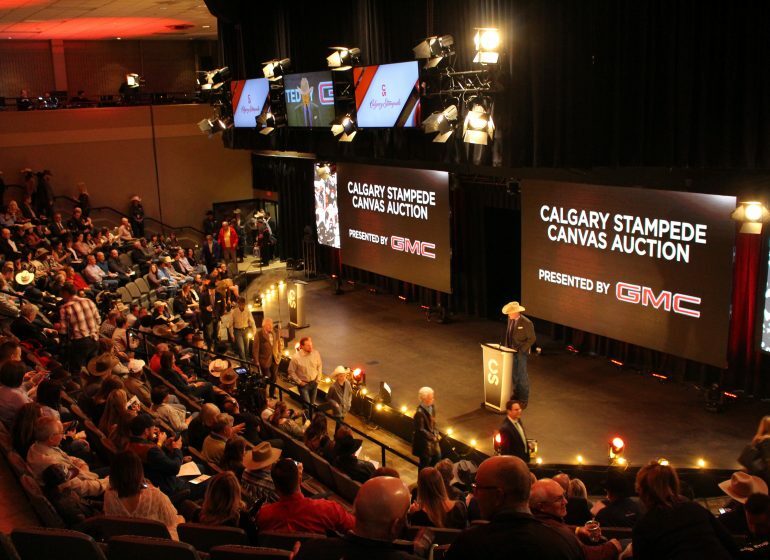 The Stampede endeavors to connect with Calgarians and share our values of western hospitality, integrity, pride of place and commitment to the community. 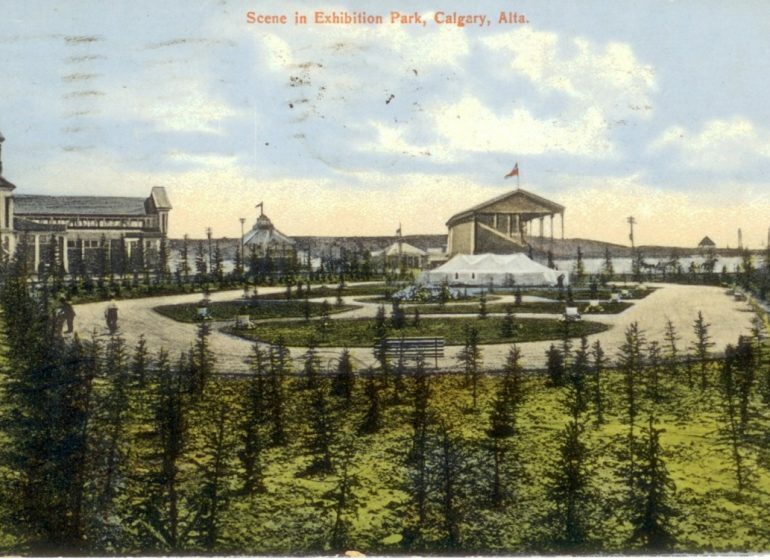 Partnering with SAIT was the perfect way to engage with Calgarians in their own backyards and generate excitement for Stampede time! 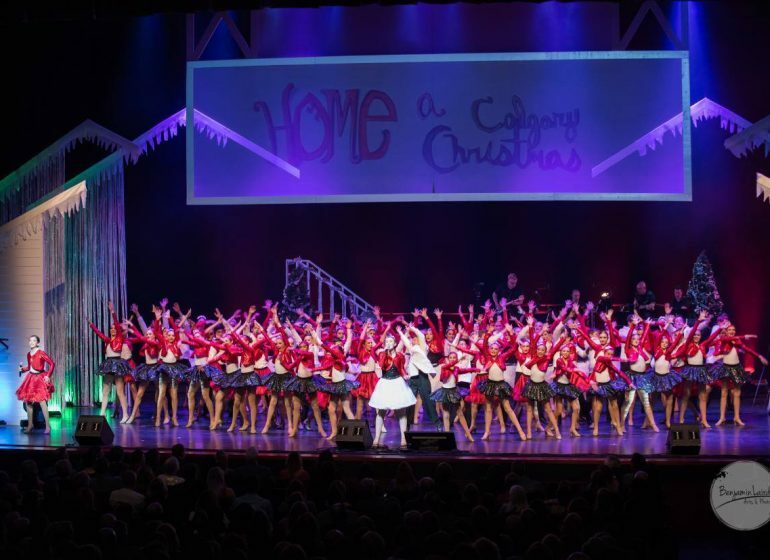 Though sometimes mistaken for Backstreet Boys due to their irresistibly sweet charms, grill skills and high action choreography– the Batter Boys are no stranger to the chuckwagon stoves! 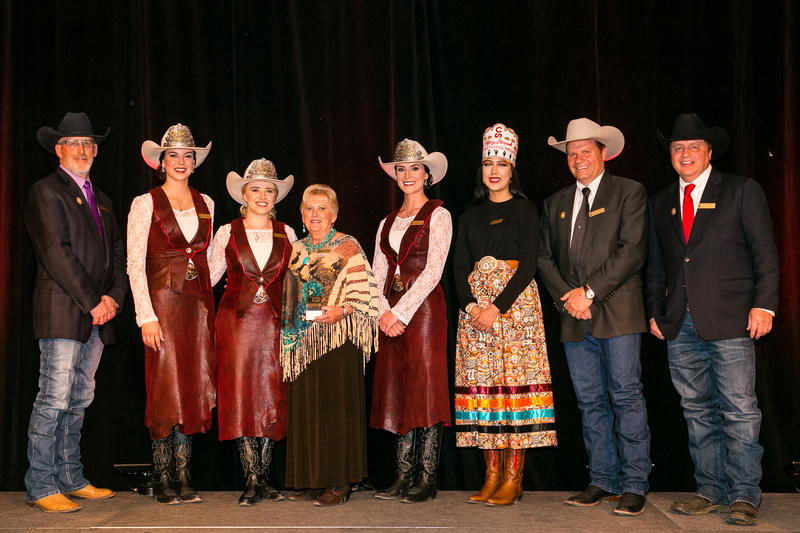 These expert flapjack flippers are part of a year-round volunteer committee that travel near and far to provide the Stampede’s unique brand of western hospitality. 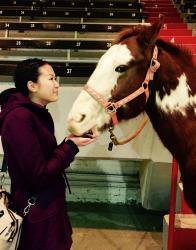 More than 4000 guests stopped by to taste our pancakes and get in the Stampede spirit. 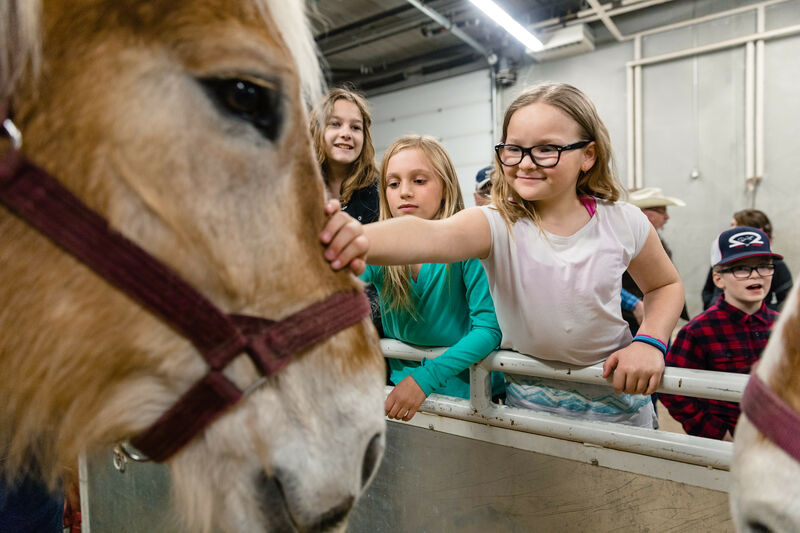 The day was a great success and we cannot wait to see how our five recipes may have inspired folks to create their own twist on the Stampede staple at their pancake breakfasts! 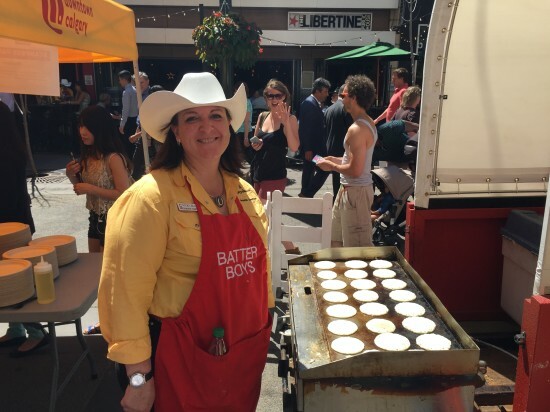 Pictured: Batter Boy, Vicki, serving up some fan favourites on Stephan Avenue. 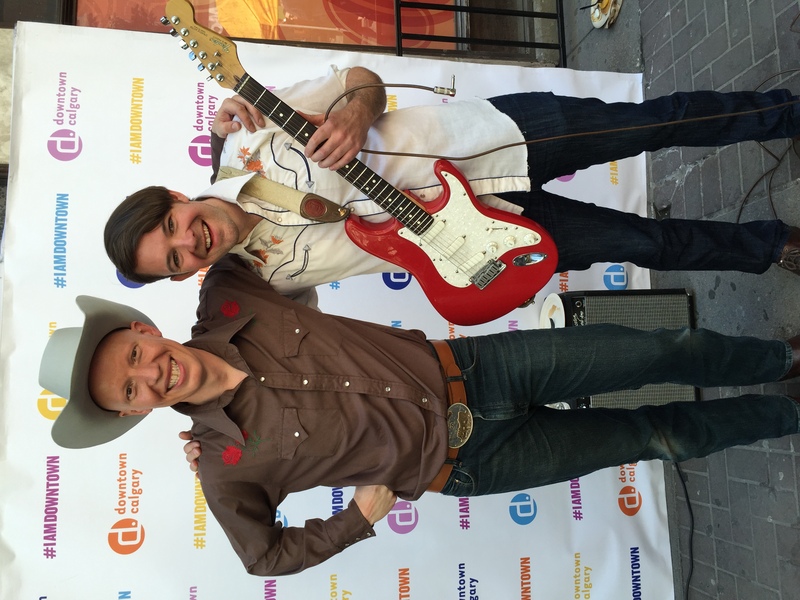 If you missed the event but your appetite is whetted in anticipation of #2015Stampede, start your pancake planning now! 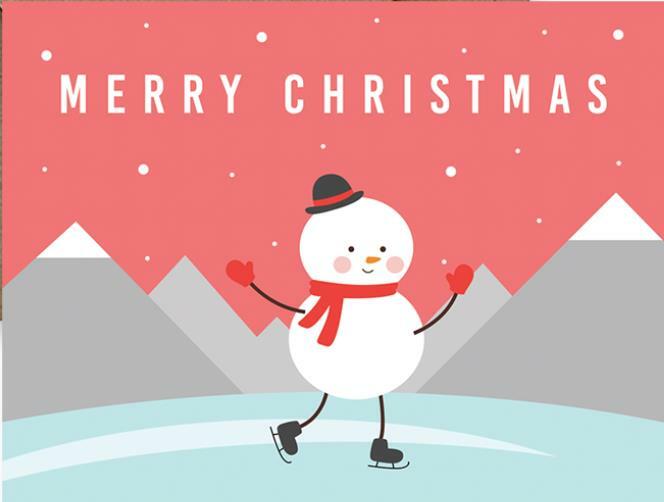 Here is an excellent resource that keeps tabs on pancake events around town during the July festivities and here is a link to the 2015 Caravan breakfast schedule.